by monitoring every file access in real time. One of our solution experts will get in touch with you shortly. Why do you need a file integrity monitoring solution? Critical enterprise data constantly faces the risk of unsanctioned access by both internal and external actors. Files and folders containing business-critical data should be continuously monitored for any changes that could put them at risk. Using a real-time file integrity monitoring (FIM) solution is essential to protect your data and to meet the requirements of PCI DSS, HIPAA, GLBA, and other IT compliance regulations. FIM software such as DataSecurity Plus eases the work of IT admins by continuously tracking all file accesses and instantly detecting security breaches. You can use DataSecurity Plus to swiftly spot and respond to events that indicate a compromise, thereby strengthening your organization's security posture. not a single organization was 100% PCI DSS compliant. Pinpoint any unauthorized changes by selectively monitoring critical files, folders, or even users. Spot and reverse accidental changes by viewing original and altered file names. Track unwanted activities in real time. 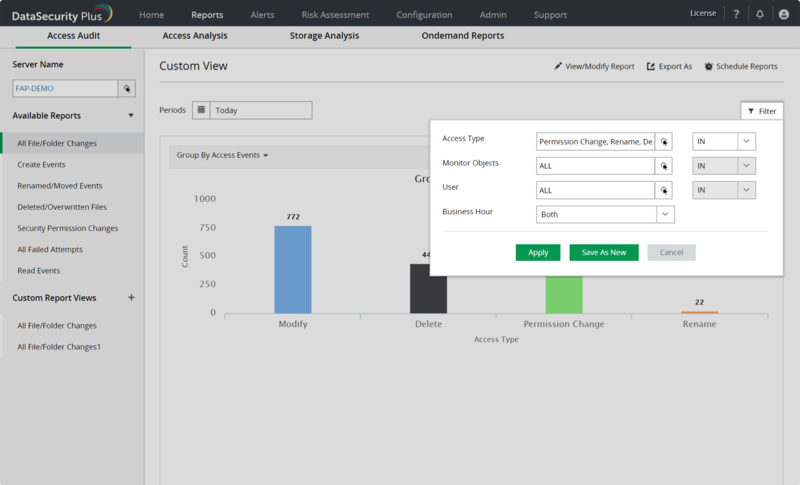 Detect data breaches instantly by monitoring potential risks such as user activity during non-business hours or permission changes to business-critical files. Identify privilege abuse with real-time alerts for permission changes, failed access attempts, and more. Monitor your servers for sudden spikes in access events, which are typically red flags in any file server environment. Accelerate intrusion detection with our repository of known ransomware file types and automatically respond with mitigation techniques. Perform root cause analysis easily. Identify the source of security incidents by using actionable and accurate forensic data. You can also analyze old audit logs and generate clear, concise records as legal evidence. One FIM tool to cover multiple needs. Meet PCI DSS, HIPAA, GLBA, and other compliance requirements, and secure your organization's file server environment. Everything you need, at a glance. 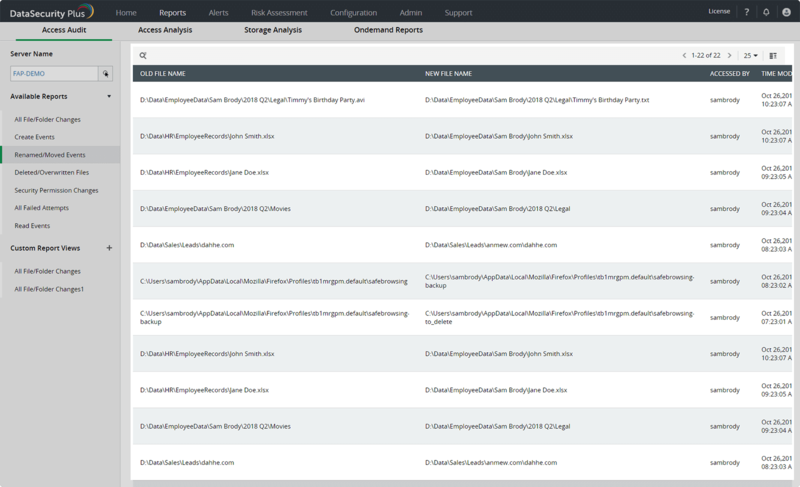 Monitor all changes made to your file servers in real time. View details about critical events like permission changes, file changes after business hours, or changes to specific files by specific users. 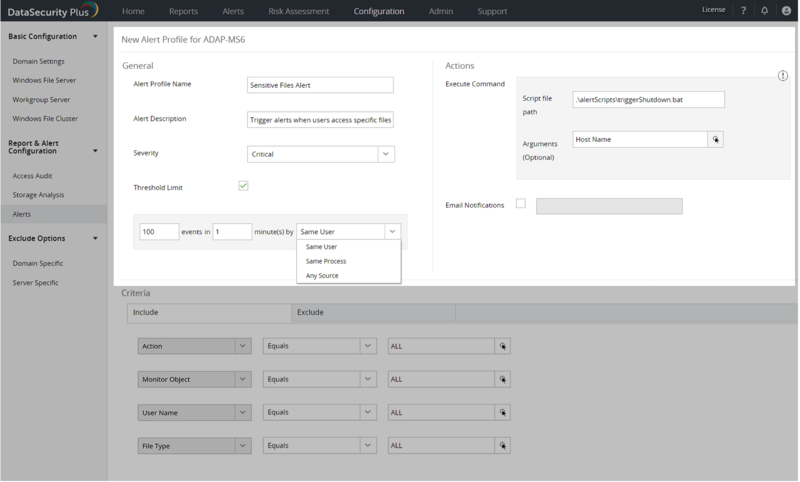 Configure alerts for specific events. Receive notifications whenever a user modifies critical files and folders. 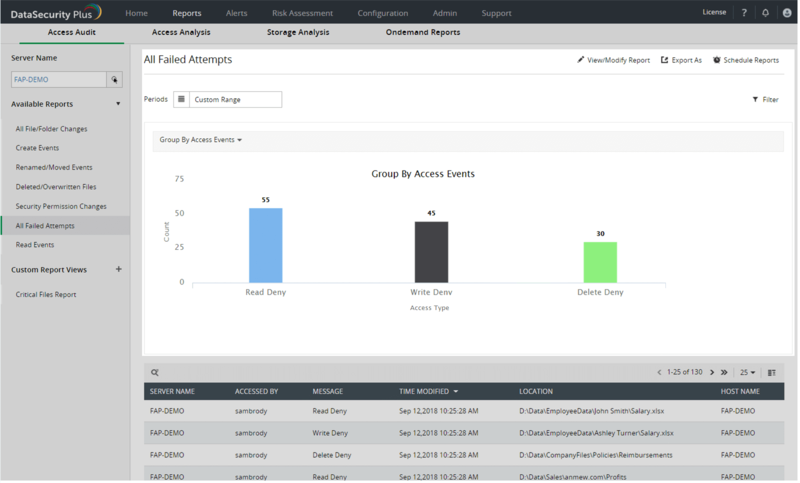 Trigger alerts when a suspiciously large number of events occur by establishing safe limits unique to your organization. Automate your response to security incidents. Disable compromised user accounts, shut down infected devices, or create your own response strategies as per your enterprise's needs. Track and reverse accidental move or rename activities. With reports that show original and changed file names, you can easily find misplaced data and move it back to where it belongs. Catch suspicious users by monitoring all failed access attempts on your files. Reduce the possibility of data theft by detecting multiple failed attempts and responding accordingly. Audit file and folder access. Analyze files and disk space. Detect and respond to ransomware. Data security and visibility in one package.